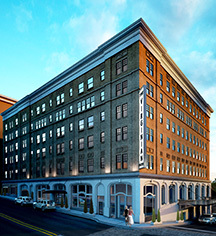 The Virginian Lynchburg, Curio Collection by Hilton has been the centerpiece of downtown Lynchburg since 1913. This magnificent hotel has been thoughtfully restored to its historic grandeur and refreshed with numerous amenities for the modern traveler. With 115 guestrooms and suites, guests can settle into spacious accommodations with comforts like complimentary WiFi, an HDTV, mini-fridge, Keurig® coffeemaker, and cozy bathrobe. The suites offer a living area with wet bar, sleeper sofa, and a private bedroom with a second HDTV. Many of the suites have a dining area, perfect for executives, large groups, and families. 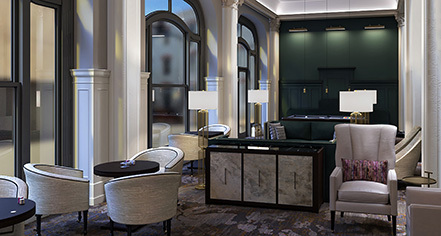 Guests can start the day at the hotel coffee shop, enjoy an intimate fine dining dinner, see Lynchburg from a new vantage at the rooftop restaurant and bar, or enjoy meals delivered in room. Host an elegant wedding in the 2,880 sq ft historic ballroom for up to 440 guests or an intimate event in one of the smaller ballrooms and event spaces. Additional hotel amenities include a convenience shop, lobby gift shop, 24-hour business center, and complimentary 24-hour fitness center. Located in downtown Lynchburg, guests can easily walk to delectable dining and lively drinking establishments, shop at specialty boutiques, stroll along the James River, and dive into the arts and creative scene. The downtown area is full of hidden gems, Point of Honor is a mile away, and the Snowflex Center is nearby for year-round skiing. The Virginian Lynchburg, Curio Collection by Hilton, a member of Historic Hotels Worldwide since 2018, dates back to 1913. Famous guests included then-actor Ronald Reagan, who stopped at the hotel during a political tour in 1957. Pet Policy: Service animals allowed: Yes. Pets allowed: Yes. Deposit: $50.00 (Non-Refundable). Maximum Weight: 70 lbs. Learn more about the History of The Virginian Lynchburg, Curio Collection by Hilton .